We’re back from a week vacation in the Big Apple! It was fun, exciting, reinvigorating, challenging and HOT*. Now, I have to admit that before we left on our trip, I had some serious reservations about NYC + 2.5 year old toddler. I mean, the two aren’t really known to be synonymous with one another right? Our son is rambunctious, curious and has singlehandedly perfected the art of having random illogical tantrums in the most inopportune moments and places . The weather, as mentioned, turned out to be scorchingly humid. And we realized that entering and exiting the subway could be challenging for stroller pushers. 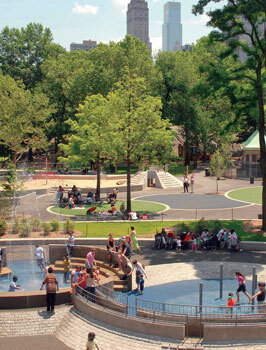 But, what ended up being our saving grace was the plethora of city parks dotted all over Manhattan. What we would have done without them, I’m not sure. I think we would have all come home very angry. 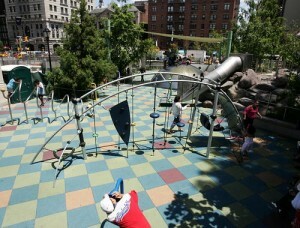 This playground is located at the south end of Central Park. I recalled this playground from a previous visit to CP years ago and thought it would be great fun to bring our son there to explore. This playground has it all, from swings, slides, massive sandpit, water areas complete with mini-moats, climbing areas, soft surfaces and it’s appropriate for children of all ages. The downside? Our son was so overwhelmed by the expanse, he didn’t want to play there. 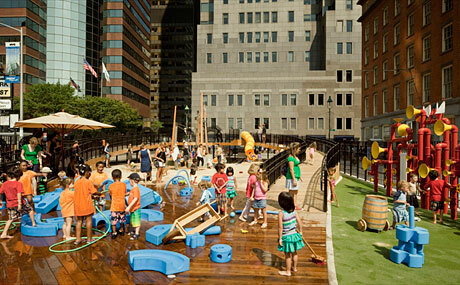 This playground is located on the north side of Union Square. It’s got the usual playground equipment and also includes Dr. Seuss megaphones and a huge metal mountain that is super challenging to climb in anything but bare feet. This is one of my favourite pockets of town. I like the shopping in and around the square and the farmer’s market that’s open Monday, Wednesday, Friday and Satursdays. The Flatiron Building is just a few blocks north. This one was hands down my favourite one that we stopped at. It had ramps, water, slides, sand and giant foam blocks for building structures. It’s located just a block west of the waterfront, facing the East River and a FANTASTIC view of the Brooklyn Bridge. The area is experiencing some renovation and rejuvenation but what they have in place in the area is really holding it’s own. Great shops and a giant beer garden, movies in the evenings and live bands to boot. Now, this one is not technically a playground. It’s just a huge deck with tons of fountains for little (and big) people to gallop through. The backdrop of the planetarium doesn’t hurt either. Great for when you need to cool off from the New York heat! *Two days before we left, Graeme and I looked at the weather report and it looked like our stay would be dotted with solid 30 degree plus temperatures and rain. He looked at me and said, “Maybe taking this trip is a mistake”. Really! He says this 48 hours before leaving!? Whew! Welcome back…it’s been cool here! Funny to think your son would be overwhelmed by anything! Thanks! I too was stunned! I mean, he loves getting into everything! But the park was big and I don’t think he could rest his eye on any specific activity. There was too much to do. Who would have guessed he would be challenged by park chaos!